This comes a little late, especially with a bunch of lucky people getting to play with the HoloLens and an awesome Halo model at E3, where the HoloLens apparently had a few changes since I last tried it. Regardless, let me regale you with the tale of my experience with this fantasy-become-reality wearable at the Build 2015 Developer Conference in San Francisco on the 29th of April. Microsoft announced they were accepting sign-ups for people to try out the HoloLens right after the opening Keynote (they started by saying they brought down a 100 sets, imagine the emotional ride as we realized we weren’t going to be able to bring one home). 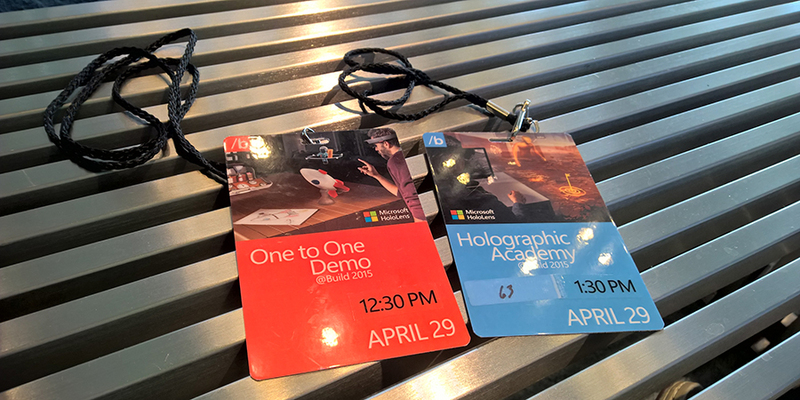 There were 3 categories available for sign-up – One-to-One Demo, Media Presentation, and Holographic Academy Training. With the link out to register, the people around us whipped out their phones to book their slot. My friend and I had our laptops out, being in a conference call with our awesome colleagues back home. Registration for us was fast and easy, and we noticed that people were having trouble registering – the last step of the form (selecting your category) wasn’t working on some mobile devices! We ended up on the first batch of attendees to be on the One-to-One Demo, a 30-minute session with the HoloLens from 12:30pm to 1:00pm at the Intercontinental Hotel next to the Moscone Center. Microsoft staff gave us special tags similar to the Build ones and brought us up to the 27th floor of the Hotel, each step of the way paved with employees and security. After another round of verifying our identity and getting an awesome free t-shirt, they had us store all our belongings in lockers. Definitely expected behavior – the technology was still extremely hush-hush. We were brought into another room and a special apparatus was used to measure our Interpupillary Distance (IPD), a reading that was necessary to calibrate the HoloLens to each individual. I wonder if the final version will require such calibration for each person before use. The IPDs (I’m a 62.5, by the way, since everyone in the room decided to have a friendly competition with the numbers) were written down on cards to be passed to the staff attending to us later. They brought us through three commands to be used with the HoloLens – Gaze, Gesture, and Voice. Gaze and Voice are exactly that – where you look and what you say. The Gesture that was taught was basically reaching out your hand, clenching it and doing a little tap. Finally, we were brought into different rooms where each of us (finally) got to put on the HoloLens. Adjusting it was easy enough, there’s a little knob at the back that you can tighten and the visor could be moved nearer or further away. Good for people who wear glasses. At this time, the HoloLens was still an unfinished product and a computer was present for calibration and debugging purposes. The first thing that I saw was the Windows Holographic logo in the middle of the visor along with 4 framing walls. The HoloLens had to be adjusted so that the walls could be seen. The employee brought me to the middle of the room and the demo started. HoloLens Studio – as demonstrated at the “Windows 10: The Next Chapter” press event in January, was what I’d be working with. The entire demo was split into three segments, first of all being “Cameron’s Game Room”. Here, I was made to face a wall with hanging portraits and a plant in the corner. Using the voice command “Scan”, a grid scanning interface came up and wrapped perfectly around the portraits and plant as I looked around. This allowed the HoloLens to learn the environment. Next, I took a signboard from the toolbox and using voice command “Magnet”, stuck it wherever I wanted. I could then move around the room and the sign with it staying in position. The scenario here is a person “Cameron” is looking to remodel his game room and wants to see what it’ll look like first. Next, we played with a 3D model of an aquarium. I dragged it out of the toolbox and placed it. The model was small and I used the voice command “life-size” to expand it. Every component of the model could be interacted with, and I used various commands such as “rotate”, “copy”, “spray paint”, “erase”, and “magnet” to customize the model. I recall erasing the gate blocking a fish, using magnet to move it in front of some divers and then copying it multiple times. Then, I rotated some of them to face different directions and customized their colors using the spray paint tool. The last segment was a Star Wars X-Wing (which was really cool at the time with Star Wars Day round the corner). We used the spray paint tool again to customize the model’s coloring – I made a few mistakes so the color scheme wasn’t symmetrical, making my OCD flair up. We could walk around the X-Wing to customize it, the model behaved perfectly. At the end, we were shown our finished product on a tablet. They then sent the model for 3D printing using Sketchfab. We went to collect our belongings and got an amazing poster to bring home. I managed to snag a very hurried picture (after asking permission) of the HoloLens on the way out. The HoloLens is everything they say it is – revolutionary mixed reality with extreme precision and interoperability with other Windows 10 devices. Like many other sites report, there is a fixed rectangle you must look through and the holograms do not cover your entire field of view. I had a little issue with calibration where I shook my head and the rectangle fell out of view, resulting in flickering holograms. I hear there has been improvements to the field of view since then, though – and I’m sure with the right amount of calibration, the HoloLens will indeed be an accurate tool with endless possibilities. In a few days time, I’m going to get to try the HoloLens again at the Microsoft Student Partners Summit. Watch this space.